The Calder Group story began in the early 1700’s and now its companies are the largest producers of lead sheet in Europe, manufacturing products which conform to the highest specifications. Calder Group is Europe’s largest producer of specialist lead products outside the battery industry. With Group subsidiaries in France, German, Holland, Ireland and the UK producing sheet lead for construction markets, and engineered lead products for a wide range of nuclear, medical, military, automotive and other applications. The Group’s objective is to remain the leading European supplier of engineered lead solutions with a worldwide reach. One of the UK’s leading building materials suppliers, distribution lead sheet and ancillary products throughout the UK. Calder manufacture lead sheet to BSEN12588 in a modern, world class manufacturing environment based in Chester and are the UK’s leading supplier of engineered products in lead, with a wide product portfolio and a diverse customer base including nuclear power, nuclear medicine, x-ray, electronics, transport, defence and other industries. With over 250 years experience, Calder is today the centre of a global business that leads the world in the manufacture of lead and engineered lead products. Calder also supplies a full range on ancillary items to support sheet lead. 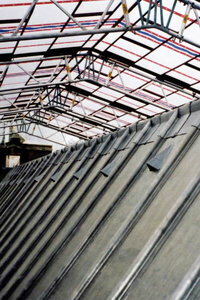 The UK factory produces lead sheet to BSEN12588, available in 3m and 6m rolls up to 2.4m wide, which ensures that the tolerances of +/- 5% provide the construction industry with the highest specification product, offering a maintenance-free life and the fixer will never live long enough to see the product fail, provided that the sheet is fixed correctly.